"On the feast of Corpus Christi the long vestibules adjoining the colonnade of St. Peter's are adorned with tapestry hangings, copied from the cartoons of Raphael and other eminent masters. The pillars of the colonnade, as well as the poles that support the awnings at the extremity of the piazza are ornamented with wreaths of laurel, myrtle, etc. ; and the Metropolis pours out its picturesque population to witness the splendid and solemn spectacle. The procession is superintended by the first Card. Deacon assisted by the Governor of Rome, both seated at the entrance of the palace: it is directed by the Papal Master of ceremonies; and proceeds in the following order. The youths of San Michele - The orphans of S. Maria in Aquiro - The different religious and monastic Communities, distinguished by their respective banners and costumes. The Roman Seminarists, in number about a hundred - Friars of the Order of Penance - Discalced Augustinians - Cappuchins - Religious of the Order of Mercy - Jerolomite Friars - Minims - Third Order of S. Francis - Minor Conventuals - Reformed Minors - Calced Augustininans - Carmelites - Servites - Dominicans - Jerolomite Monks - Olivetan Benedictines - Camaldolese Benedictines - Monte Cassino Benedictines - Regular Canons of the Lateran Congregation - The Roman Seminarists, in number about a hundred - The fifty four city-parish priests wearing stoles and surplices - The Chapter of the Illyrian church (S. Girolamo degli Schiavoni) - Chapter of S. Anastasia - Chapter of SS. Celsus and Julianus - Chapter of S. Angelo in Pescheria - Chapter of S. Eustachius - Chapter of S. Maria in Via Lata - Chapter of S. Nicola in Carcere - Chapter of S. Mark - Chapter of S. Maria ad Martyres - Chamberlain of the Roman Clergy - Chapter of S. Mary of Monte Santo - Chapter of S. Mary in Cosmedin - Chapters of S. Mary in Trastevere and S. Lawrence in Damaso, who walk together - Chapter of St. Mary Major's - Chapter of S. Peter's - Chapter of S. John Lateran's - The Viceregent of Rome with the members of his Tribunal - Camerieri (valets) d'onore di Spada e Cappa (dagger and cloak) - Camerieri Segreti di Spada e Cappa - Procuratori di collegio - Confessor of the Pope's household, and Apostolical Preacher - Bussolanti, Common and Secret Chaplains, who bear tiaras and Papal mitres - Secret Chaplains - The Treasury - Advocate, with the Commissary of the R. C. A. - Consistorial Advocates - Ecclesiastical Camerieri Segreti - The Pope's Choir - Referendaries of the Signature - Abbreviators of the Parco Maggiore - Votanti (Jurors) della Segnatura di giustizia - Chierici di Camera - Auditor of the Rota; and Master of the Sacred Palace - Two Secret Chaplains, one bearing the Pope's costly tiara, the other his costly mitre - Maestro del S. Ospizio - Acolythe, who is a Votante di Segnatura, bearing a golden censor - Subdeacon, who is an Auditor of the Rota, carrying the Cross; and seven Acolythes bearing wax lights, near whom are two Ostiarii, called de Virga Rubea (red stick) - The twelve Penitentiaries of S. Peter's in Sacerdotal vestments, preceded by Acolythes, bearing wands inserted in bunches of flowers - Abbots, who are Generals of monastic Orders - Non- Assistant Bishops and Arch-bishops - Patriarchs - The Cardinal-Deacons, Cardinal-Priests and Cardinal-Bishops - The Conservator - The Assistant Prince, and the Governor of Rome - The Assistant Cardinal - Deacons, between whom walks the first Deacon - The Master of ceremonies, and Thurifers (usually older youths) with golden censers, who immediately precede the B. Sacrament, which is borne by the Pope under a stately canopy, alternatively supported by eight students from the English, Irish and Scotch colleges. The Pope, although apparently kneeling, is really seated in a sort of Curule chair, and is borne on the shoulders of his Palafrenieri (footmen), dressed in liveries of scarlet silk. The Sovereign Pontiff is moreover surrounded by various Prelates, Official attendants and guards; is flanked by two Ecclesiastical Camerieri Segreti, bearing the flabelli (gigantic fans made with feathers); and followed by the Uditore della Camera; the Tesoriere Generale; the Maggiordomo; the Apostolic Protonotaries; and the Generals and Procurators-General of various religious orders. Immediately behind follow the different corps of Roman cavalry and infantry in their gala uniforms. Having made the circuit of the piazza, the procession enters S. Peter's, the gilded ceiling of which reflects the bright effulgence of the moving illumination beneath; and the triumphal ceremony concludes with the Eucharistic Benediction, imparted to the adoring multitude, from the great altar, by the Father of the Faithful, amid the clangour of military music, and the roar of artillery from the castle of S. Angelo." This somewhat confusing and enthusiast description is taken from a guide of Rome (Rome Ancient and Modern) written in 1842 by the Very Reverend Jeremiah Donovan: the procession of Corpus Christi (or Corpus Domini) was just one of the many processions taking place in Rome at that time: today only the procession of Good Friday at the Colosseum can be compared with those of the past, although the ceremonial is much streamlined and oriented towards spiritual aspects rather than pomp. However a glimpse of the past can still be caught in the procession taking place in Trastevere on a Saturday in the second half of July. 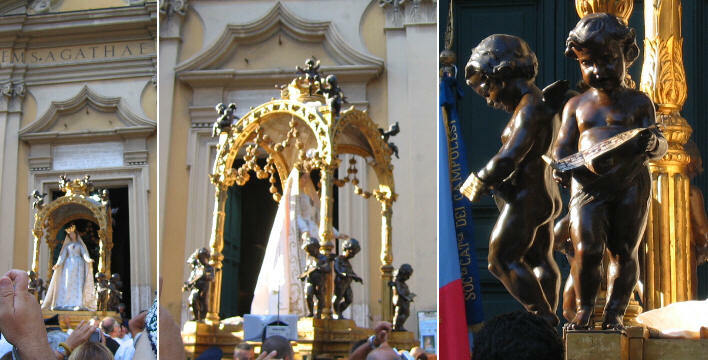 The procession celebrates the so called Madonna de Noantri (noantri is a dialectal word meaning noialtri, a strengthened form of noi=we), a statue which is usually kept in S. Agata and which for the occasion is moved to a larger church, S. Crisogono which is located very near S. Agata. For the occasion the statue is attached to a base and placed under a highly decorated (and very heavy) canopy. The statue was found in 1535 in the Tiber and it was brought to the Carmelitan friars of S. Crisogono: it was soon declared patroness of Trastevere and kept in a specially built oratory opposite S. Crisogono. In 1890 the oratory was pulled down and the statue was moved to S. Agata. The procession is opened by a giant cross, which is followed by members of various brotherhoods, dressed in their historical costumes and holding their banners (in the image above two Carmelitan brotherhoods and a group of Trinitarians). 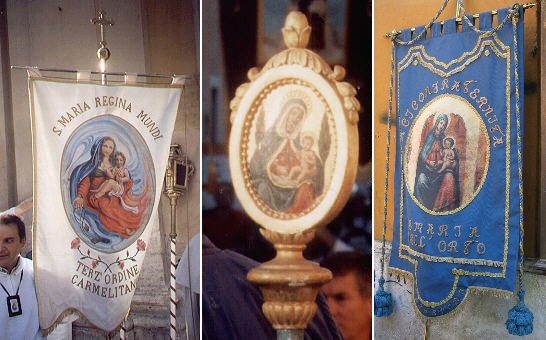 Some brotherhoods have modern banners and come from other quarters of Rome while Arciconfraternita di S. Maria dell'Orto is a very old brotherhood and it is located in Trastevere. To participate in bearing the canopy is regarded as a high honour, but it is not a light task. The porters have a cushion under the vest on the shoulder bearing the weight. 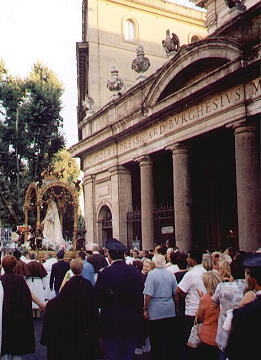 The procession lasts a couple of hours because the Madonna pays a visit (in a sort of socializing tour) to most of the churches of Trastevere, rather than just crossing the street and going to S. Crisogono. The procession stops at each visited church and the porters can have a little rest. The itinerary includes S. Maria della Luce, S. Giovanni Battista dei Genovesi, S. Maria dell'Orto, S. Francesco a Ripa and S. Pasquale. 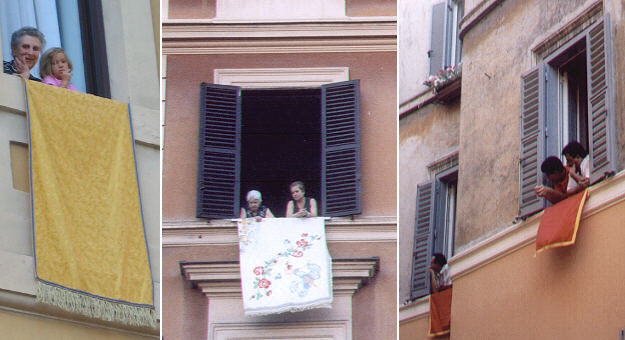 The image on the left shows a tapestry especially made for decorating a building during processions and other festivities (the window belongs to the house next to S. Agata). Private households decorate their windows in less formal ways. The celebrations last eight days at the end of which the image of Madonna de Noantri is moved by another procession, which in part takes place on the Tiber (in memory of the location where the statue was discovered), to S. Maria in Trastevere, the main church of the rione. Do you fancy a slice of porchetta? The attendance at the procession and during the following week at various events, mainly related to revamping Roman traditions, is high and not limited to those living in Trastevere. 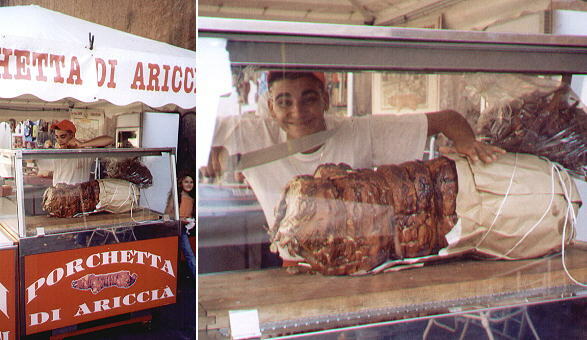 Although its caloric contents is not suited to the July heat, nevertheless porchetta, the roasted baby pork, a typical product of Ariccia, sells well. Wreaths of laurels are laid at the monuments of two poets who wrote in Roman dialect and for the occasion some of their poems are read in public. I doubt however the following sonnet by Giuseppe Gioacchino Belli is ever included in the selection. s'era messo a ggodessela in disparte. Oh, disse lei, e ttu non pianti maggio? Bella mia, disse lui, nun ciò er bajocco. de cuell'anime sante e bbenedette. Giuseppe Gioacchino Belli (1791-1863) wrote more than 2,000 sonnets which were published after his death. They depict, sometimes in a very crude manner, the hypocrisy of the Roman society of the first half of the XIXth century. The sonnet quoted above talks about an elderly prostitute who does not charge her services to a penniless eager teenager, as a personal suffrage for the souls in Purgatory. Trilussa (Carlo Alberto Salustri 1871-1950) portrayed the Italian society during the Fascist period, although in a more subtle way, often using fable patterns to hide his satire. The short poem describes a man who loudly calls by their names a pig and a donkey; at least, he says, I have the satisfaction to call things as they are without ending in jail. Eight days later, the celebrations are closed by another procession which takes place on the Tiber, thus the adjective fiumarola (of the river). 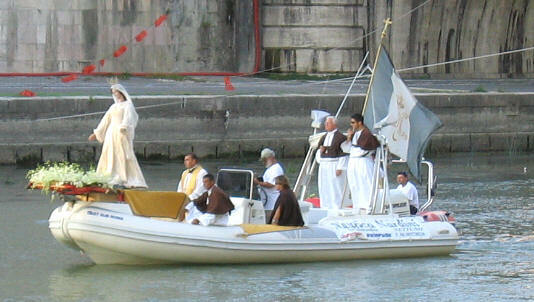 The statue (without its heavy baldaquin) is placed at the front of a boat leading a small procession of other boats. In the old times the ceremony started at Porto di Ripetta (now lost) where large stairs allowed easy access to the river; today the embarkation takes place near Villa Giulia, where there is an access to the river which echoes the old one. The boats reach Ponte S. Angelo where they are met by those who will follow the procession walking on the river banks. The ceremony takes place in the late evening when the Roman July heat subsides. The dome in the image on the left belongs to S. Carlo al Corso. Many inhabitants of Trastevere prefer to wait for the arrival of the procession at Ponte Sisto, the historical bridge linking this quarter to the rest of Rome. When the procession reaches Isola Tiberina, it is almost dark on the river, while the last rays of the sun hit the ruins of Palazzo Augustale, the residence of the Roman emperors on the Palatine hill. The statue is then carried to S. Maria, the main church of Trastevere. 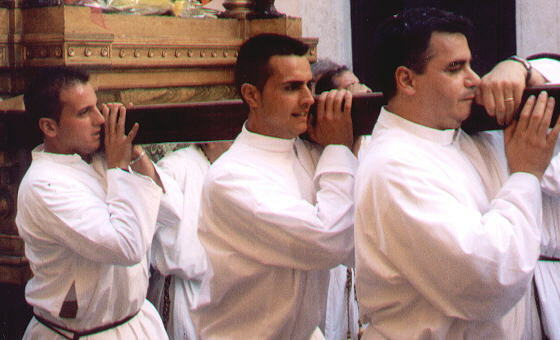 On Monday morning, immediately after dawn, a short procession brings it back to S. Agata.